The global instant coffee market is characterized by a high level of competition and is considered to be consolidated in nature, states a new research report by Transparency Market Research. The increasing demand for instant coffee around the world is predicted to attract a large number of new players throughout the forecast period, which is likely to enhance the competition among the leading players. In 2016, the prominent players in the global instant coffee market, namely Tata Global Beverages, Unilever Plc., Jacobs Douwe Egberts, Starbucks Corp., and Nestlé S.A. accounted for a share of around 90% of the overall market and are expected to remain dominant in the coming years. The rising number of collaborations is another major factor estimated to encourage the growth of the market in the near future. According to the research report, in 2016, the global market for instant coffee was worth US$28.12 bn and is anticipated to reach a value of US$42.5 bn by the end of 2025. With the development of distribution channels, the market is projected to register a healthy 4.80% CAGR between 2016 and 2025. From a regional outlook, in 2016, Asia Pacific led the global instant coffee market holding a share of 35.7%. This region is predicted to remain in the leading position in the next few years, thanks to the increasing demand from India and China. 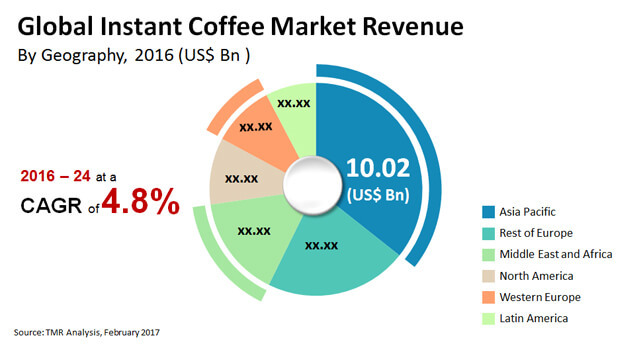 In addition, the increasing popularity of instant coffee due to its easy availability and preparation technique are estimated to accelerate the growth of the Asia Pacific market in the near future. The demand for instant coffee is expected to remain high in several parts of Europe throughout the forecast period. On the other hand, with the rising preference for filter coffee, the North America market is likely to witness a downward trend in the coming years. The global instant coffee market has been classified on the basis of distribution into business to business (B2B) and retail. Among these two, the retail segment is likely to account for a major share of the global instant coffee market. The easy availability of a wide range of products and a tremendous rise in the number of retail outlets across the globe are expected to accelerate the growth of this segment throughout the forecast period. In addition, the attractive offers provided by several retail stores to enhance their sale figures are likely to encourage the market’s growth in the next few years. The rising popularity of instant coffee among the younger generation and the increasing disposable income of consumers are the key factors anticipated to encourage the growth of the global instant coffee market in the next few years. In addition to this, the improving lifestyle of consumers, especially in developing economies and the increasing preference for coffee in comparison with tea are predicted to accelerate the growth of the overall market in the near future. These factors are expected to boost the demand for instant coffee across the globe and benefiting the players operating in the market. On the other hand, the rising consumption of aerated drinks is considered to restrict the growth of the global instant coffee market in the next few years. Moreover, the rising awareness among consumers regarding the harmful effects of excessive coffee intake is estimated to curtail the growth of the overall market in the forecast period. Nevertheless, the increasing expenditure of players on advertising and marketing activities is projected to boost the demand and fuel the development of the global market in the next few years.